Router experts, Bob and Rick Rosendahl, show you how to inlay a beautiful, Hand-Painted China Plaque into a traditional Walnut Trinket Chest for a truly unique project. While Bob shows you how to use the inlay tools, Rick shows us an interesting way to cut simulated feet in the base. That's the "China Inlaid Chest"...Today on the "Router Workshop"! Click Here to purchase the PDF plan and the TRW Episode 801. A) What is the length of the box or item?This question is asking that you define the front of the box for both inside or outside measurements. The rabbet dado leaves the end grain showing on one of the two sides. And it is perferable to have the end grain on the side and not the front of the box. B) What is the width of the box or item?This question is defining the side of the box for both inside and outside measurement. The Rabbet/Dado joint has end grain showing on one of the two sides. We intend to have the end grain showing on the side of the box. C) What is the offset?The Offset is the boundry distance that the top and bottom extend over the size of the box. This number is defined as a measurement hang over each side. The total over size of the top and bottom is twice the offset. D) What is the height of the box or item?The height of the box for outside measurements is the overall height of the box, which includes the top, bottom and box sides. Using the inside measurements option means the exact size that will fit in the box. You might want to add a small amount to be sure there is some room for the intended item to fit in the box. E) What is the thickness of the top and bottom?Just as the question states this is the thickness of the top and bottom. Usually the best number for this is .75 or 3/4", which is set as the default. F) How many boxes are you making?Defines the amount of boxes you are making. This number is doubled and placed into the material list under number of pieces. 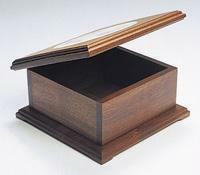 G) What is the thickness of the box sides?The thickness of the box sides needs to match the detail information on "How To make a Rabbet/Dado Joint." In short if the measurement is .50 or 1/2" then you need to use a 1/4 or .25 spacer fence to make the joint. CAUTION: You can't just make this number any size it has to match the size of Spacer Fence. 1/4" Spacer Fence needs 1/2" thick material. 3/8" Spacer fence needs 3/4" thick material. H) What are your measurements from?Outside Measurement: This uses the box as the desired measurement and has nothing to do with what is fitting into the box. It makes the outside measurement the priority and is used if you are trying to make the box fit into some other sized hole or space. Inside Measurement: This uses the size of the piece or item to fit inside of the box as a way to define the material parts list. Please be sure to add a bit to the exact item to ensure it will fit into the box.